The Doll People are back, on their wildest adventure to date! Annabelle, Tiffany, and the rest of the Doll and Funcraft families find themselves in quite a pickle - instead of spending some time in the attic while the bedrooms are being renovated, they are accidentally carted off with the charity donation boxes. Now they are steaming out to sea and away from the Palmer family! This fourth book in the series keeps up the charms and quirks of the original three, while broadening the focus in an adventure that keeps both families deeply involved. The dolls also meet several new (and surprising) friends along the way. The will-they, won't-they questions during their adventures will keep you turning the pages for more. Brett Helquist steps into to fill the talented shoes of Brian Selznick, who has been filling his time with the incredible Hugo Cabret and Wonderstruck, among others. Helquist keeps the fun and feeling of the original illustrations while still imparting some of his signature style. 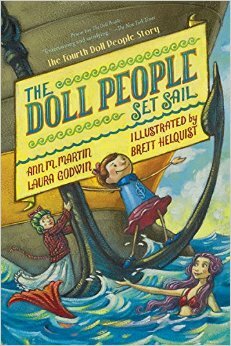 The Doll People are a popular series among my third graders, and I know that the publication of this newest book will help others discover these books as well. They are a great entree into the longer, more complex world of middle grade novels, and the occasional illustrations help to scaffold the readers' comprehension and pique their interest along the way. Fans of such books as The Borrowers and The Littles will enjoy meeting another pint-sized community. This one has definitely been pre-ordered for my classroom library!